Kinetic Arts Center’s new Youth Performance Intensive is a rigorous seven-day program for intermediate and advanced level students (11-19 years) who want to experience training like a circus professional. Our Youth Performance Intensive will feature top-level instruction from master teachers focusing on skills training, performance technique, collaborative show creation, physical theatre, dance, acrobatics, flexibility and strengthening. An audition video of a three-minute act is required to determine acceptance into the program. If accepted, this act could be considered for inclusion in our two session-ending performances. Precision, focus, and hard work will culminate into a fabulous show under the bright lights. Monday, Tuesday, Thursday: 9:00 a.m. – 4:00 p.m.
Saturday: Call time – 1:00, Show time – 8:00 p.m.
Sunday: Call time – 12:00, Show time – 3:00 p.m. The Youth Performance Intensive is designed for intermediate to advanced level students who have two-plus years of consistent circus training and some live performance experience. Successful candidates are self-motivated, focused, hard-working, and have experience working collaboratively on a shared performance project. As this is a physically rigorous program, performers should be in top-shape, have strong body and spatial awareness, and a keen understanding of safe training practices. 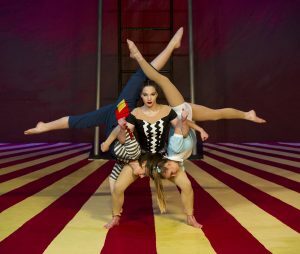 Top-level circus artists train hard in preparation for performances, and this program is no different! From the first hour of the first day, students will be engrossed in training and preparing for performances only five days away. The Intensive includes a combination of group training with master instructors in specialty disciplines (ex. physical theatre, acrobatics, dance, and group choreography) and a student-specific focus while refining existing acts. The Intensive will culminate in two fully-produced performances where students will showcase elements of what is learned during the course of the Intensive. Enrollment to this Intensive is limited and we will select candidates based on the information submitted through the online application form. All participants should be physically fit and able to keep up with the rigorous pacing of the week. Acceptance emails will be delivered no later than May 17, 2019 and will include contracts and additional information about training during the Intensive. Student response to secure their space is required upon acceptance into the Intensive. Fees for the Intensive is $950 and a deposit of $475 must be paid within one week of acceptance into the program or (by separate arrangements) in installments via auto-payments. Unless otherwise arranged, the remaining balance is due by June 1, 2019. Program tuition includes all instruction and performance related expenses including costumes, lighting, etc. Additional materials will need to be purchased separately ahead of the program start date (a detailed list will be sent as we get closer to the start date). Cancellations received by May 13, 2019 are refundable less a $50 administrative fee. Any cancellation received after the May 13, 2019 are subject to full payment and not refundable.